A campaign of civil disorder is due to start in Georgia, says the opposition. It follows the expiration of an ultimatum for the president to step down. Mass demonstrations in the capital are set to enter their third day. The ultimatum for the president to step down by 4 pm (12:00 GMT) on Friday has expired, and now the opposition leader, Levan Gachechiladze, announces a campaign of civil disorder. Firstly, this means that the protests will expand beyond the Georgian capital, Tbilisi. Secondly, living in Tbilisi during the next couple of days is not going to be something easy. The opposition is planning to move to several points around the city and block traffic. They are going to be outside one of the state-run television channels, and they are also planning to hold protests outside the presidential residence. In their statement, the opposition leaders have made clear that they want to openly disrupt Saakashvili’s schedule. So, what they are going to do is to try to find out about any meetings or plans that the president might have over the next couple of days, and purposefully keep him from getting to where he needs to be. If Saakashvili still does not give in to their demands, these protests will expand even further. It won’t just be two or three streets that are blocked. They say people will be staying on the streets day and night, until he does turn in his resignation. “If we do not succeed in gaining what we demand based on the peaceful psychological pressure on Saakashvili within a few days, we are going to expand our campaign of civil disorder,” stated Eka Beselia, one of the leaders of the "Movement for United Georgia”. “As many sites will be picketed in Tbilisi as will be necessary, in addition to the present three, to make Saakashvili resign,” she added. The president is confident that the elections that were held last year were free and fair. It is also important to mention that he was openly supported by the West, and international organizations, and NGOs did declare those elections were free and fair. So, he feels he is in his right to stay in the office until his term runs out. The Georgian leadership, said earlier, "The question of resignation of the president of Georgia – a country with a population of 4.5 million people – cannot and shouldn't be solved by 150,000 participants in the protest rally." Saakashvili said he would't resign until his presidential term officially ends in 2013. On Thursday, over a hundred thousand protesters came out to demand that Saakashvili steps down. Nino Burdzhanadze, the ex-speaker of the Gerogian parliament, has apologized to the country’s population for not taking enough of a stance during the meeting on the 7th of November, 2007. “We have no democracy in this country, which Saakashvili promised during the revolution of 2003. He has broken his main promises to the people. Instead of the promised democracy we have an autocratic regime right now. He also promised to re-unite the country, but instead of unification he lost even more territories than we had before under the control of separatists. These reasons are enough to call for the president’s resignation,” said Nino Burjanadze. Roland Oliphant, a political analyst from "Russia Profile" magazine, said Georgia's president is facing some tough challenges, both at home and internationally. "The Obama administration is going to be a lot less sympathetic to him and is not going to tolerate things Saakashvili did last time. There is a lot more antipathy towards him this time,” Oliphant said. Many of the present-day opposition leaders are former close allies of the Georgian president, including Nino Burdzhanadze and the former ambassador to the UN Irakly Alasania. It is important to say, that if Mikhail Saakashvili steps down, Alasania is seen as the favourite to, perhaps, become the next president of Georgia. So far, no clashes have been reported. 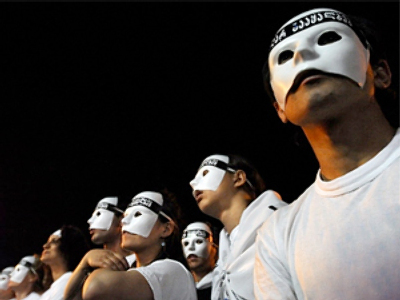 However, many fear government forces might resort to violence to disperse protesters, just as in 2007. Security has been stepped up.